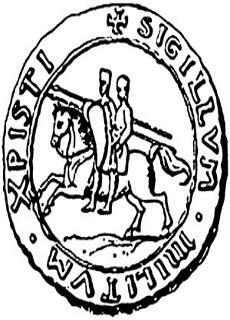 Seal of the Templars - two men riding one horse as a sign of their oath of poverty. The order was founded in 1119 and named after a Muslim mosque in Jerusalem that they used for their headquarters. The King of France and the Pope rose up against the order and destroyed them in France after allegations of Devil worship, and envy over the Templar’s holdings. After being outlawed the order went underground and changed it’s name to the secret society known today as Freemasonry. Baldwin’s palace was an old mosque known today as Al-Aqsa. When it was taken over during the first crusade it had been converted over to a palace and stables rather than destroying the false house of worship. After the Templars were given the blessing of King Baldwin II he funded them, and gave them part of the mosque to dwell in. The Templars believed that the mosque was in fact the Temple of Solomon, and they gave themselves the name Knights Templar (Knights of the Temple) based on this false belief. King Baldwin II wrote a letter to Bernard the Abbot of Clairvaux asking for help to influence then Pope Honarius to grant the Knights Templar official status in the eyes of the Holy See. Bernard held favorable views of the Templars, and was even the nephew of one of the Templars that came to meet with the Pope. Hugh de Payens led five other Templars to Rome, and were welcomed by the Pope. In January of 1128 the Pope met with the them at the Council of Troyes in Champagne, along with other Abbots, Bishops, Archbishops and Cardinals. Bernard was unable to attend the meeting, but wrote a letter of recommendation on the Templar’s behalf which aided the Pope in his decision (the Pope being a former underling of Bernard). The Order received the Pope’s blessing and given the plain white mantle as their official clothing. Pope Innocent II basically made the Knights Templar their own distinct Church, by declaring that they do not have to pay any secular taxes, or pay any tithes to the Catholic church. The bull also states that they can build their own church which they can collect money, along with the ability to create their own cemeteries to bury the dead in. All of these sweeping powers were unheard of being granted to any group, but the Templars were granted all in one bull. "As for the things that you will receive from the spoils, you can confidently put them to your own use, and we prohibit that you be coerced against your will to give anyone a portion of these. We establish that the house or ’the Temple’ in which you are gathered, for the praise and glory of God and the defense of his faithful ones, as well as liberation of the church of God, with all your goods and possessions that it is known to legitimately have at the present time or may acquire in the future through concessions of bishops, generosity of kings and princes, gifts of the faithful or in any other just away, with God’s help, shall be under the guardianship and protection of the Apostolic See for all time to come. We also establish in this present decree that the religious life that has been instituted in your house, inspired by divine grace, shall be observed inviolably and the brothers who serve the Lord therein shall live chastely without personal property, and, confirming their profession by words and morals, shall be subject and obedient to their master and to those whom he ordains. Moreover, since this house of your sacred institution merited to be the source and origin of the order, it shall likewise forever be considered the head and principal of all the places that belong to it." "And because those who are defenders of the Church should live and be sustained from the goods of the Church we by all means prohibit the exaction of tithes against your will from all moveable and unmovable possessions and anything that belongs to your venerable house. But we confirm with apostolic authority the tithes that you might extract by your zeal, with the advice and consent of the bishops from the hands of clerics and laymen, and even those that you obtain with the consent of bishops and their clerics." "While also reserving for bishops episcopal rights, in regard to tithes, as well as religious services and burials, we likewise grant permission to build places of worship in locations given to the Holy Temple, where your community resides, in which religious services would certainly be held and where, if any one of your or your community should die, they may be buried. For it is not unbecoming and constitutes clear danger to the souls if the brothers of the order commingle with multitudes of men and crowds of women, under the pretext of going to church." Once the Knights Templars were dispersed Pope Clement V transferred their holdings to the Knights Hospitaller - this left the former Templars with feelings of malice toward the Hospitallers that appears to have surfaced during the Peasants’ Revolt of 1381. Jacques de Molay made confessions under torture that he later recanted. When he did this King Philip had him burnt to death. According to legend de Molay said that Pope Clement V and King Philip would have to give an account to God with in a year. Clement died a month later, and Philip died that November during a hunting expedition. I do not pretend that birth control is the only way in which population can be kept from increasing. ... War, as I remarked a moment ago, has hitherto been disappointing in this respect, but perhaps bacteriological war may prove more effective. If Black Death could be spread throughout the world once in every generation survivors could procreate freely without making the world to full. ... The state of affairs might be somewhat unplesant, but what of that?